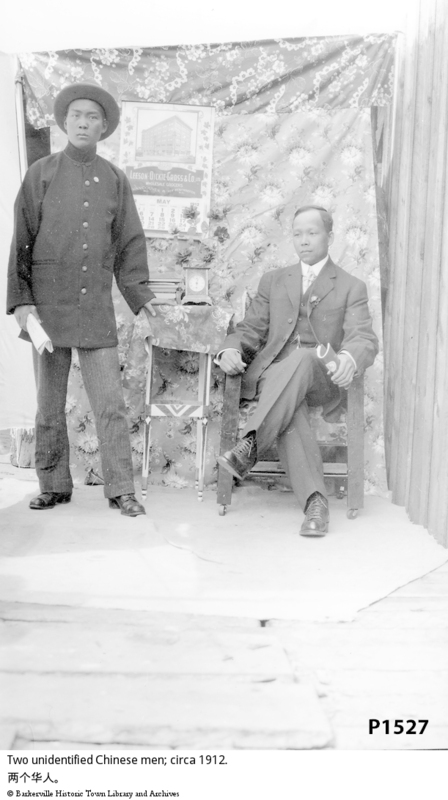 ItemBARK_1990.0003.0048 - Two unidentified Chinese men; circa 1912. Item BARK_1990.0003.0048 - Two unidentified Chinese men; circa 1912. Two Chinese men, one sitting, one standing. The one sitting is wearing a suit and sitting in a Morris chair. The other one is wearing traditional Chinese type clothing. The Lesson Dickie Gross & Co. Calendar is on the wall and a clock is on the table. See also P 1678, & P1967.